One of the things that continue to amaze me is how far feng shui has reached the four corners of the globe. 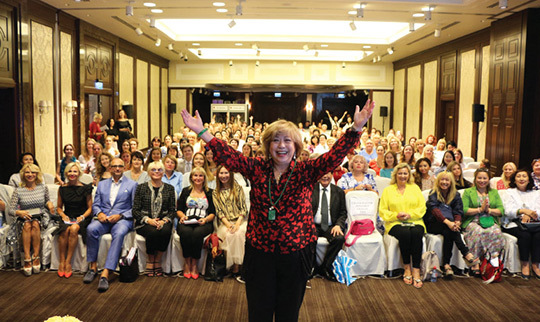 Each time we hold Lillian Too’s Master Practitioner Course (which happens about twice a year) we are always pleasantly surprised to meet students from so many different countries around the world who have read Lillian’s feng shui books at some point in their life, and benefitted from them in some pretty miraculous ways. 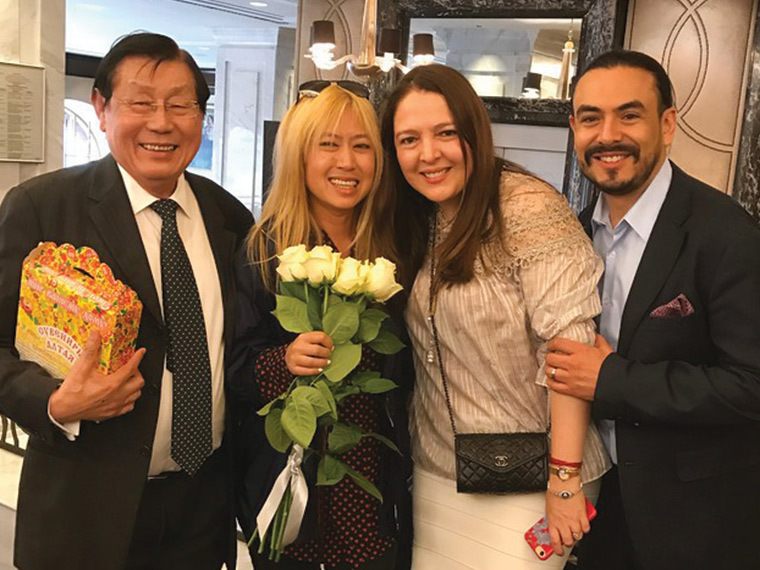 Many of our MPC students who pass through our lecture halls go on to lead amazing careers in their own field… and some even become famous feng shui speakers and consultants in their home country. 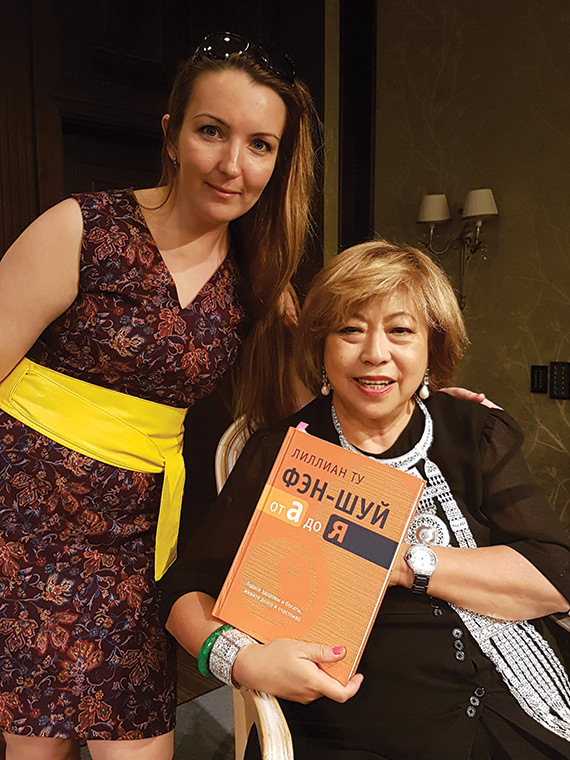 About three years ago, we met the lovely Snezhana Tikhonova, a long-time fan of Lillian and feng shui teacher from her homeland in Yakutsk. Yakutsk is the capital of the Sakha Republic, one of the states located in the Northeast part of Russia, closer to Siberia. Who would have thought that Lillian’s feng shui books would make it all the way to this part of the world! 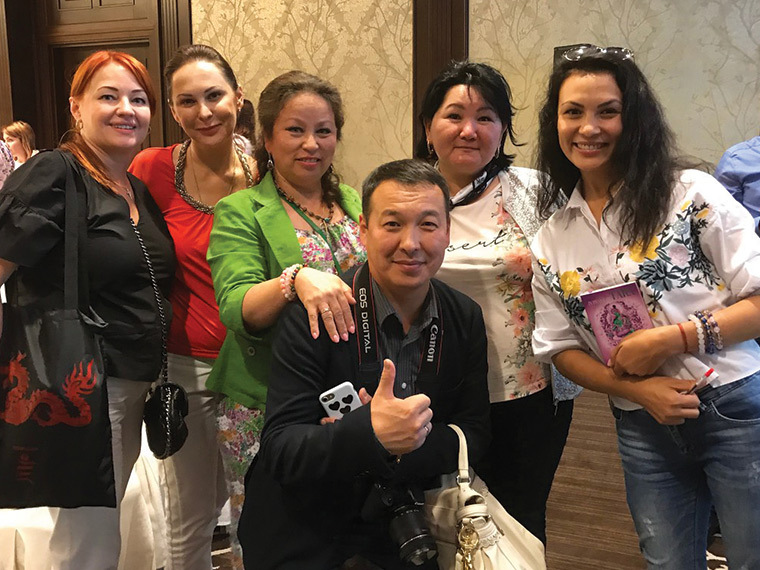 But Snezhana tells us that her own students from Yakutsk are big fans of Lillian’s brand of feng shui and dream of meeting her in person one day! 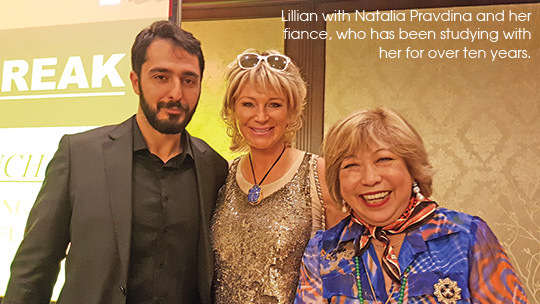 It was also around the same time that we met Tatiana Biryukova, a successful cosmetics heiress who hails from Estonia. Estonia is a former state of the Soviet Union; hence its citizens also speak Russian. We first met Tatiana when she came to participate in our first Tara Retreat… and decided to come back for a second Tara Retreat a year later. 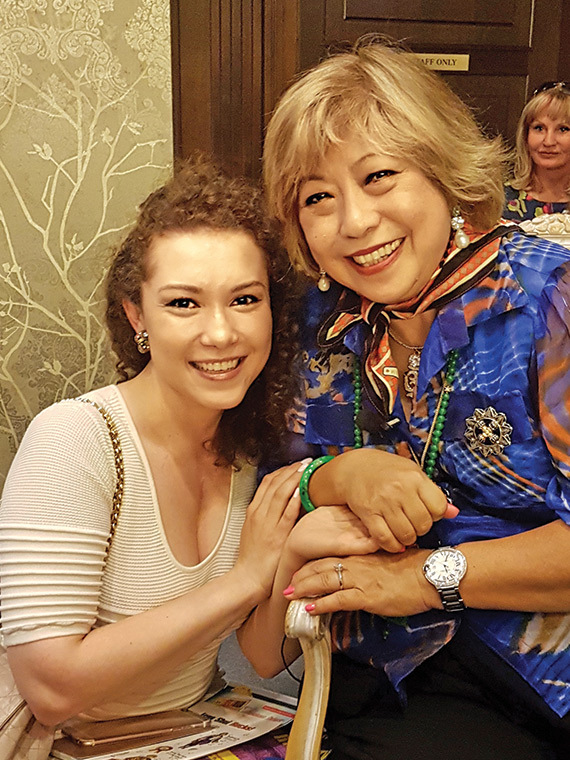 During her second Tara Retreat with us was when she met Snezhana… and the two became instant friends, thanks to their Russian heritage! Since then, the two have joined us on many of our spiritual pilgrimages and feng shui events… from Bodhgaya to Kathmandu, and India to Taiwan! And each time we meet, they are quick to repeat their request to Lillian. “Please come and give a talk in Yakutz and Russia!”! 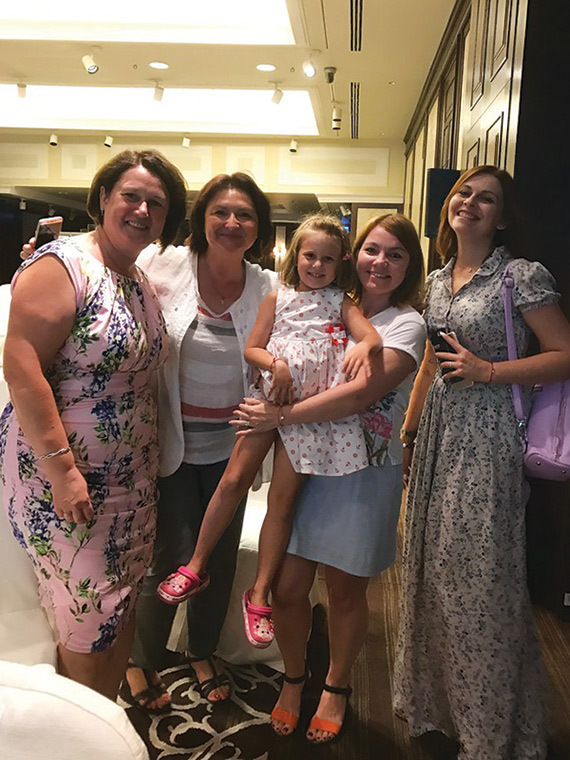 It took three years for both ladies to convince Lillian and so finally, this year, they collaborated very closely to mount an amazing two-day event in the city of Moscow! Lillian, her family and our group of WOFS staff travelled to Moscow, not knowing what to expect. Most of what we have seen or heard about Russia and its citizens come from television and movies… but the real experience of Moscow will debunk any of the post-cold-war gloomy imagery you might have lingering in your mind! Come to Moscow and you will feel immediately energized and uplifted by the abundant growth energies of this historical city. And what delighted us the most was how charming and friendly Russian people can be, and how incredibly well-educated and cultured they are! Classical music and pretty things permeate the atmosphere. Chopin, Litsz, Rachmaninoff and Tchaikovsky can be heard playing in hair salons to restaurants and shopping malls. Russians really know how to live in style and elegance. Instinctively they already practice good feng shui! Just take a stroll down the streets of Moscow and you will be greeted with fashionably dressed beauties and dashingly handsome men in suits… amidst a stunning backdrop of timeless buildings decorated opulently with intricate décor and golden domes! You cannot help but snap a thousand photos… especially when the skies are perpetually blue and the cotton-like clouds look exactly like an expensive Russian painting! In this gorgeous city, feng shui fits in quite naturally. The curve of the roads and waterways flow with good chi. The streets are very clean… and all around us are stunning trees and gardens blooming with a sea of flowers. You can feel the roaring growth energy radiating from the great Moscow River that flows past the hotel where we stayed. It is no wonder that the principles of feng shui seem to thrive in this glorious country! At the time we visited, the city of Moscow is undergoing massive renovations in preparation for the 2018 FIFA World Cup which will be held here. We were told that a hundred streets were being modernised with electric cables going underground and open drains were being covered. Not to mention the blazingly fast 4G cellphone network that reveals just how modern this city has become! 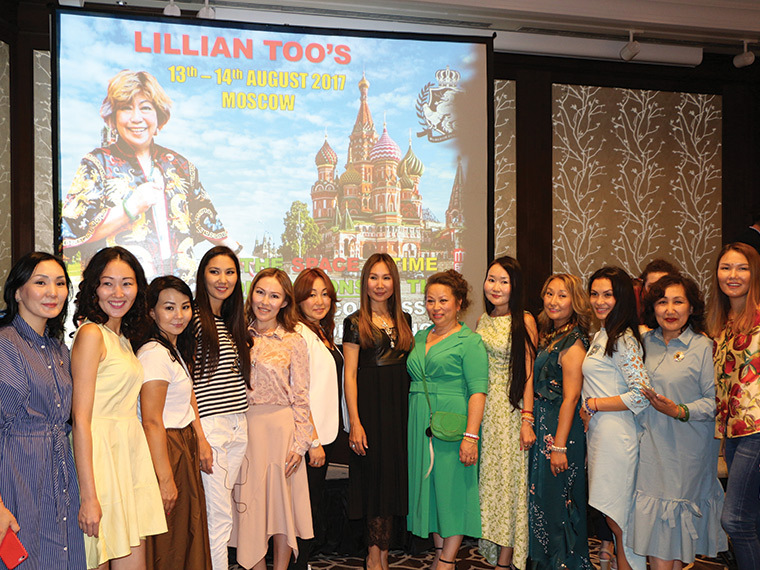 It is amidst this energetic and vibrant environment that Lillian and all of us were warmly welcomed by her fans! I can tell you that Russians are really BIG on giving flowers when they want to show how much they love you! By the end of the second day, almost half of stage was filled with giant bouquets of cultured roses. One special bouquet with pink and white stripes was given to Lillian by a surgeon in St Petersburg; and we were told that it was the only rose of its kind, cultivated in an exquisite Mexican boutique rose farm! 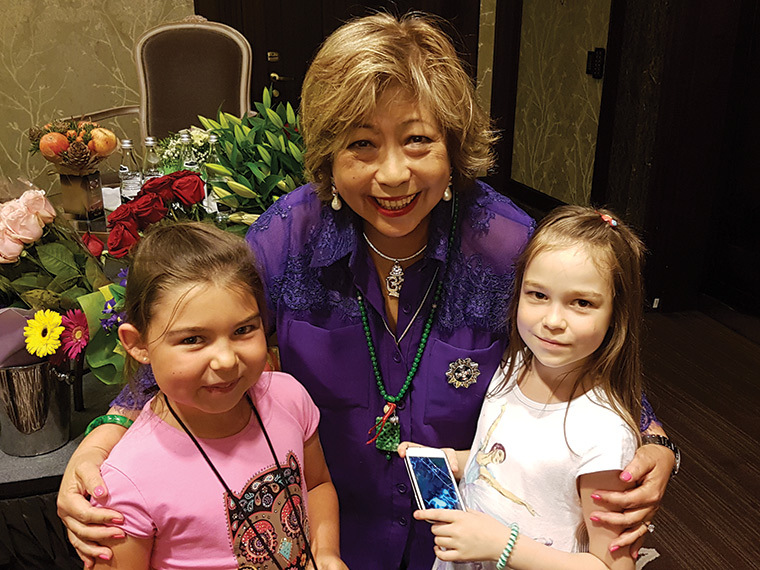 On the first day, Lillian taught her audience about the basic principles of space feng shui… on how to spot good landscape feng shui and activate the eight sectors of the Pa Kua to attract good luck. She explains that good feng shui starts with the dwelling’s external surroundings and one is most fortunate if they can live in a property that enjoys a mountain feature behind and water in the front. A powerful formula for activating good energy within the interior of the home is to identify the eight sectors of the PAKUA in one’s home; each of these specific locations in a person’s house can be energised to generate the eight aspirational types of luck: fame, wealth, career, good health, love, education and descendants. A key part of Lillian’s talk emphasized the point that in order to enjoy good feng shui, one has to take into account the time dimension of feng shui. This is because feng shui energies change from year to year; and thus energy is never static. To practise time feng shui we have to look at the annual feng shui chart of the year to see what type of energy flies to each sector. So for example, the South sector represents fame and recognition and this is usually activated with Fire energy and movement. But in the year of the Rooster, the South plays host to the Five Yellow star that brings misfortune; hence lights and movement in the South triggers misfortune instead of fame and recognition! This very vital point is a heart of practising feng shui in a mindful way, always being aware of how the annual, monthly and daily changes of energy can make a difference to the quality of energy in each sector. Lillian not only covered the feng shui chart of 2017 but treated her Russian fans to a glimpse of what’s in store for 2018, the Year of the Dog! 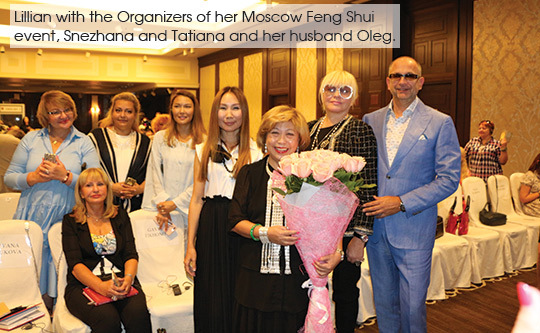 On the second day, Lillian introduced her Russian fans to Spiritual Feng Shui. She explains how the methods of spiritual feng shui can add great depth and power to space and time feng shui. When all three dimensions - space, time and spiritual - are practised together, the results are often quicker and more powerful! Over time, the energies of any given space can grow stagnant and afflicted, and thus yin energies start to build up in the home, which can cause fatigue, quarrels and theft. If left to decay further, yin energy can result in accidents and severe illness. Hence the most effective way to clear away these energies is to develop the habit of space cleansing regularly. In her talk, Lillian revealed two easy methods to cleanse one’s space. The first is the clapping cure, which was a huge hit with her Russian fans! This simple method, combined with the right cleansing mantra, is the easiest way to dissolve any dead chi and infuse the space with vibrant new energies. Another ritual that Lillian herself practises every day in her home is to burn incense and fill one’s space with incense smoke. The smoke itself purifies the molecules of energy in one’s immediate environment, but when it is accompanied with specific mantras and offering invocations, the ritual becomes an excellent medium that enables us to enlist the assistance of the cosmic beings! In her talk, Lillian explained that the local spirits of the country, city and individual houses play the most important role in ensuring the spiritual energy of a home is nourished and safeguarded. Thus making incense offerings regularly to these beings can help lift away obstacles that prevent us from living a good life. When the local spirits are happy, the energy of the home naturally promotes harmony, prosperity and well-being. When making incense offerings to cosmic beings, Lillian explains that it is crucial that we invoke the Enlightened Buddhas and offer incense to them first. Buddhas are enlightened beings – they are all-compassionate and omniscient, and their hierarchy in the natural order of spiritual power is right at the top! They’re the BOSS! So when we invoke their presence by offering incense to them first, it ensures local spirits and any wandering spirits are endeared towards helping us. In her talk, Lillian also introduced her fans to King Gesar, Guru Rinpoche and Tara. 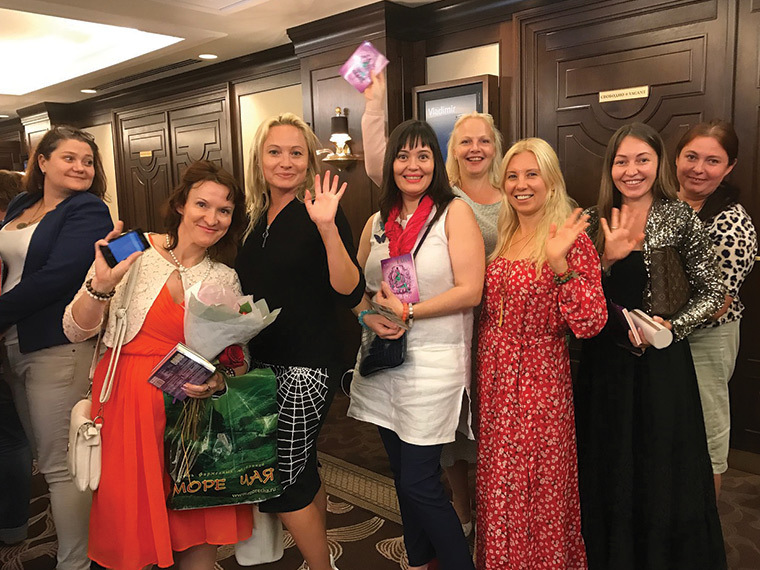 If you missed her seminar in Moscow and would like to watch it, the video will be made available via Lillian Too’s Mandala Ezine (English and Russian translation available). Don't forget to check out the gallery below by clicking on the photo thumbnails!